carved in three-quarter relief, the wise layman shown with confident expression, his eyes narrowed in a steady gaze beneath incised eyebrows, his lips pursed in a gentle smile, wearing a close-fitting headdress painted in red, the hairline and the close-cropped beard ending in a goatee painted in black, the surface of the face weathered to pale tan color with traces of pigment remaining on the eyes and lips. 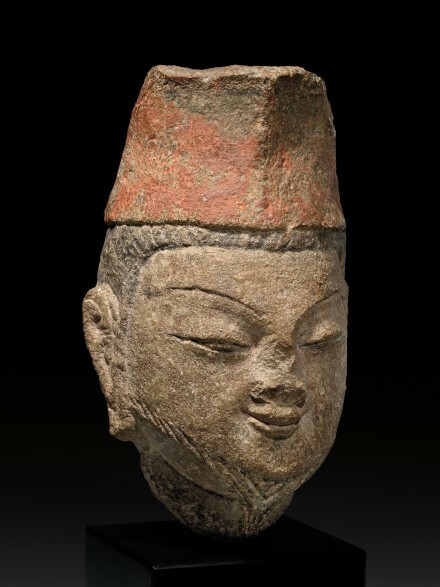 The present sandstone head comes from the east niche of the south wall of Cave I in the Yungang Buddhist Cave-Temples. In photographs taken early in the 20th century by Sirén and Iwata, the figure of Vimalakirti (維摩 Weimo) is seen at the center of the niche, turning slightly to his left in conversation with Manjusri (文殊 Wenshu), the Bodhisattva of Wisdom. The story of the Bodhisattva Manjusri visiting Vimalakirti derives from a chapter in the Vimalakīrti-nirdeśa sutra (維摩經), written in India circa A.D. 150 for teaching of the Dharma. The sutra was first translated into Chinese in the 3rd century, but the most influential version was the translation by Kumārajīva (鳩摩羅什, 344-413), a monk-scholar from the Kucha kingdom in Central Asia. The imagery of Vimalakirti successfully debating with Manjusri appears in murals and carved reliefs in the Buddhist cave-temples at Dunhuang, Yungang, and Longmen. Compare, for example, the sandstone niche carvings of Vimalakirti at the Yungang grottoes, Caves VI and VII, illustrated by Mizuno in “Archaeological Survey of the Yün-kang Grottoes,” Archives of the Chinese Art Society of America, Vol. 4, 1950, p. 54, figs. 16 and 17.